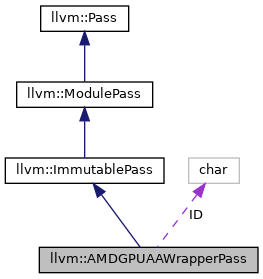 Legacy wrapper pass to provide the AMDGPUAAResult object. Definition at line 73 of file AMDGPUAliasAnalysis.h. Definition at line 79 of file AMDGPUAliasAnalysis.h. doFinalization - Virtual method overriden by subclasses to do any necessary clean up after all passes have run. Definition at line 92 of file AMDGPUAliasAnalysis.h. doInitialization - Virtual method overridden by subclasses to do any necessary initialization before any pass is run. Definition at line 86 of file AMDGPUAliasAnalysis.h. References llvm::AMDGPUAAResult::AMDGPUAAResult(), llvm::Module::getDataLayout(), and llvm::Module::getTargetTriple(). Definition at line 52 of file AMDGPUAliasAnalysis.cpp. Definition at line 83 of file AMDGPUAliasAnalysis.h. Definition at line 84 of file AMDGPUAliasAnalysis.h. Definition at line 77 of file AMDGPUAliasAnalysis.h.